Welcome to day four of the Write On Sisters Blogging from A to Z Challenge. 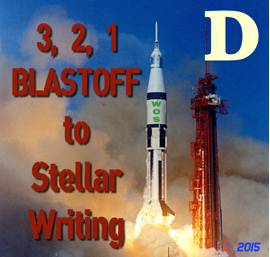 Today we BLASTOFF with D is for Dialogue. This is ground control, come in Space Station! Repeat! Come in Space Station! We don’t think much about how we talk to others until it’s gone. If you’ve ever gotten laryngitis you will know what I mean. It makes you feel helpless! It seems counter intuitive, but we just can’t write dialogue the way we talk in person. Real verbal communication is full of non speech sounds and dull pleasantries. Here are some simple tricks to keep your crew talking. Think about the communication goal. Why do these characters need to talk? Is it to show character bonding or fighting? Is it a way to transmit background information to the reader? Unless there is a plot-related reason for the exchange, your dialogue might be story filler. Don’t use dialogue to tell the reader information they already know from the narrative. Instead use the dialogue to develop new story elements, increase the tension, build character relationships and bring in backstory components. Don’t use tags carelessly. If only two people are talking you may not need any tags at all. In a group scene, consider foregoing tags in the early drafts as a great way of evaluating how successfully you’ve created distinctive character voices and physical tells. You will need some tags, but not as many as you might think. I’ve said this before and I’ll say it again here: novel writers should read plays and scripts. This is where you will find the best examples of clever, sharp, raw, inventive and boundary stretching dialogue. These are the writers that live to put words into characters’ mouths! Don’t cheat yourself of their wisdom. Read Shakespeare. They are all good, but A Midsummer Night’s Dream or Much Ado About Nothing are my favorites. Yes, the language is archaic, but the timing, the banter and the quality of the conversation is just unmatched. Read, watch or just live in the moment that was Veronica Mars. Not the movie; stick with the TV show. Witty, intelligent and able to stand the test of time, this show has some of the best dialogue ever put on TV. Or study Sherlock, another solid dialogue standout. We have a number of posts on writing dialogue (use our search in the sidebar to find them), or just read this one by Heather. I think it’s our best one. I agree, Much Ado About Nothing has such fantastic banter! Thanks for the great tips. Great theme – lots of wonderful tips. Thanks for stopping by my blog. I’ll have to look into Veronica Mars… this is the 4th or 5th time I’ve seen the TV show mentioned this month! You’re in for such a treat, the show is cult classic! Make sure you get the TV show, the movie was not on the same level as the show. I will admit, I have to be careful with my dialogue. I use it as a way to get to know my characters. I let them go to town, allow them to banter with each other – almost like a script – until their personalities emerge. This can have a negative effect because the characters are sometimes too familiar with one another, so there is a risk of the reader feeling left out (met too!). That said, I do love to use dialogue to show personality and development. It can be a lot of fun. I haven’t thought about reading scripts/plays to improve my dialogue, but I’m thinking about it now! I’m going to head on over to check out the other article you recommended. Also, I agree whole-heartedly about Shakespeare – in Much Ado About Nothing the banter is just genius! Always good to read writing tips even when you think you know what you’re doing as a writer, prompts like this keep you on track, so thanks for sharing. My first book, I had to tighten up the dialogue. I had a lot of pointless bits that, while realistic, just bogged the story down. I like writing dialogue the best. It’s fun. I envy you, dialogue is something I need to slave away over. Calling it “fun” is not my experience. : ) But I do feel proud of myself when I get it right. Writing dialogue is an art. Agreed that it shouldn’t be used to reiterate plot points, but rather to move the story along. Dialogue can make or break a book. I’ve seen it all, the same dated slang words being used by more than one character, too much jargon, too few distinctive voices and speech patterns. Writers who excel at dialogue are rewarded with happy readers. Dialogue is tough. Thanks for the tips and for the link. A great help! I have been thoroughly enjoying your blog. Thank you for all your wise advice – it’s gold! I am learning so much about writing craft. I hope you are considering publishing a book based on all these materials. I am also grateful for your post about from A to Z blogging challenge and joined it too this year – it’s good fun! I’ll pass on your kind words to Heather. She wrote yesterday’s post on Character Change and will be back on Monday with our E post. Thanks for this. Dialog is one of the most difficult things to write! I am not a natural writer of dialogue. I have to work at it and work at it some more. Then I have to dump the early drafts and rework it. But reading scripts has helped me a lot. I’m now able to pick up on the good examples when I hear them.